The Miami Paranormal Research Society specializes in haunted dolls and other items. They have quite a collection of dolls given to them by individuals who did not understand them or who were afraid of having a spirit attached to them. Is it possible for a doll to truly possess a soul? I believe it is. Thoughts like these conjure up thoughts of the killer doll named Chucky featured in a few movies. What makes this all the more terrifying is that there are real cases of possessed dolls. Back in the 1970's there was a famous case of a demon possessed Raggedy Ann doll named Annabelle. Key west is home to Robert the doll, whom although enclosed in glass is still very active then there is another famous haunted doll named Mandy. It may seem like a haunted doll, is a bit strange, but it is not at all uncommon. Bears and toys spend a lot of time with their owners, especially children. These are very treasured objects and strong bonds are created with them. These objects absorb both positive and negative energies. Over the years I have encountered countless haunted objects, furniture, jewelry, cars, dolls and bears. Of these, dolls and teddy bears are the objects that are most likely to be haunted. Teddy bears have always been most prized possessions which are brought on car trips, vacations, off to grandma's house. Cherished bears serve as protection during stormy nights, provide comfort during times of crisis and have even accompanied deceased children on their journey to the afterworld. Being the focus of all of this energy, its only natural for a toy to absorb the energies that are focused on it, both positive and negative. The focus of this article is an adorable brown bear named Christopher who somehow never made the final journey with his deceased child owner and yet the bond remains unbroken. Christopher was found in a thrift store in Illinois that benefits victims of domestic violence. Christopher sat on a shelf beside many other abandoned childhood treasures. This particular bear was much different from the others because he had an energy about him. His energy is described as a magnet. It is not difficult to connect with Christopher or the spirit connected to him. In fact, his first night in his new home yielded the name of Christopher. What is still unknown is if the spirit of the little boy attached to the bear was named Christopher or if that was the boy's name for the bear. Christopher soon came into contact with a sensitive- a high Priestess of Witchcraft who also heard the name of "Chris," without having been told anything about the bear. The Priestess was also able to sense the spirit of the lost little boy of about three or four years old, wearing a baseball cap. Children are able to sense remarkable things about Christopher. He was first residing in a home with a young girl. Within a few days after Christopher's arrival, the girl was awakened one stormy October night. She told me that she saw a little boy looking at her from outside her mother's bedroom window. She described him as liking sports. "How do you know this?" I asked. "Did you talk to him?" "Because he's wearing a baseball hat," she replied. This poor girl was understandably frightened by the site of something she did not think she should have. In recounting this event, the girl's mother believed that a spirit followed them home from a recent visit to Bachelor's Grove Cemetery. First of all, there are no records of a boy of his approximate age buried at Bachelor's Grove. Christopher was also dressed in modern clothing. Spirits to not usually follow anybody from one place to another. 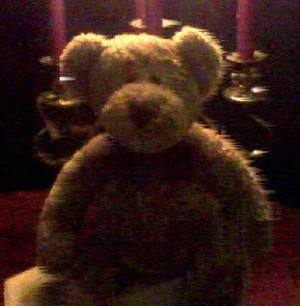 The spirits of Chicago's Bachelor's Grove are attached to that cemetery for a reason, just like Christopher's spirit is attached to this teddy bear. Spirits aren't about to leave a place that they have such a strong connection to. Of course, the exception to the rule is a haunted object. The spirit attached to it, moves when and where it does. From further study of Christopher the bear, it is believed that this little boy had died a very tragic death; he was murdered. It is still unclear exactly how he died or who the perpetrator was. The activity that has been reported with this teddy bear is amazing. It is said that other toys in the room are found in other locations. What is most amazing is that Christopher the bear moves into different positions on his own and even changes facial expressions. I interviewed Thomas Myers one of the founders of the Miami Paranormal Research Society that has possession of the bear. He describes the his first encounter with Christopher and the first time he noted that the bear's expression changed. "I was driving and we were taking Christopher on an investigation out at Evergreen Cemetery to see if he reacted. He never reacted in the cemetery but while we were on our way, I was joking about him and when I looked at him I noticed that he was making a very unpleasant facial expression. I was shocked! My reaction was one of surprise and after a few minutes, I think my surprised mollified him because his expression became cheerful after a few minutes. I was so shocked that I grabbed him underneath his chin and began examining him. " Christopher is by no means a malevolent spirit; on the contrary, he is a playful and even helpful spirit. There has always been a sadness about Christopher. He seems to be searching for a loving family and hopefully, the lost spirit of little Christopher experiences the joy of childhood, which in this life he did not.